The stokes croft bike lane: a new record! You won't be seeing our white van today, as the team is all at home watching TV. Well, watching adult videos while drinking red bull and vodka, but it fits in with the day. However we do welcome contributions, as usual to bristol.traffic at gmail dot com. and raise you eight police vans! We also have proof that Welsh vehicles are exempt from one way signs. There, how you deal with that, friends of the north? update: Gamu asked why we hadn't included the registration numbers. An error of omission, due to the rush to get this out. Here are the two from the photos: CN59DVO WX08DHE. As they say, Whose police state? Our police state! Two police walking down to Slix in daylight hours, no minicab outside it. Unusual. The Banksy posting now taking on more relevance. Ritas is undamaged -happily- but again, no minicab outside in the bike lane. And what's this, a pickup with the driver being talked to by the police, while Chris Chalkley of the People's Republic of Stokes Croft loiters in the background. The police were just talking, there's no need to worry about this piece of treasured parking area being taken from us tax payers as part of a Cycling City-funded attack on our rights. Behind this scene -nine tree hill- which now has a lot of broken glass on it. Chris of the PRSC said they are looking for people to collect money for all the damaged shops other than Tesco -anyone who has time can get down there, pick up the collection tin and start collecting. Whenever someone is asked -they make their excuses and leave. A few minutes at the Stokes Croft/Ashley Road junction shows it is quiet there. The only hint of recent troubles is this sign on the pedestrian crossing. Incidentally, some press coverage likened the area to "Camden". This is ridiculous: Camden is about the same size as NW Bristol, includes Hampstead and its Heath (local version: Clifton and the Downs), as well as places like Camden High Street, Gospel Oak, Kentish Town, even the University of London area. A more accurate description of the area would be a main road that has some areas that went upmarket so long ago that most people have forgotten when they weren't (Kingsdown, Cotham), some areas that are undergoing more recent change (Montpelier) and some areas that have a long cultural identity based on ethnic diversity -but a culture that is itself at risk from ongoing gentrification. The street itself is a mix of classic local venues (Slix and Ritas) as well as new places (the Canteen), leading to diverse options of an evening. Even we, the 'traffic van drivers, like to walk around there, eating our cheese chips while skimpily-dressed working ladies ask us if we have a light. For London-based reporters, an equivalent in Camden would be something like Edgware Road, with St Pauls being replaced by Notting Hill & Portobello Road; Kingsdown and Cotham by the Abbey Road area. Kilburn and Cricklewood would represent the areas further up the A38 -Gloucester Road and Horfield respectively, though these areas lack the ethnic diversity of NW London, where the older Irish and Caribbean areas have merged with the new immigrants to produce a dialect and culture all of their own. The Bristolian Cafe is offering special "Riot Fry-Ups"
Claims were made in the press that people had been digging up cobbles and throwing them, but the only cobbled street we know of nearby -Picton Lane (good secret parking, BTW), is unchanged, except there is now a security person sitting in the sun at the back of the mini-Tescos (not photographed). but as there is still some spare yellow line space, this is not an issue. We got a blip in web traffic last week with people searching online for "Stokes Croft" and "Stokes Croft Tesco". We are Bristol's premier road-related news outlet --and given this road's role in both transportation and fast food, this extra traffic was not surprising. 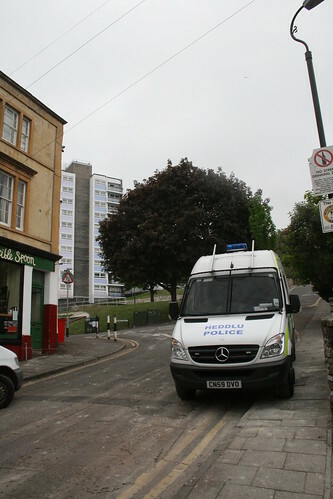 To keep our out-of-town visitors informed, we drove the official Bristol Traffic White Van down to Cheltenham Road and 'the Croft to see what was happening. The Tescos is boarded up, Fred Baker Cycles has a few hundred pounds worth of damage. All eight cyclists who read this site might want to consider visiting the shop and buying something there, to show your support for a local shop in the area that never chose to be alongside a new supermarket. The outbound bike lane has a car in it, this time a police car. The inbound bike lane also has a car in it. Up on the now infamous Telepathic Heights, someone sits on the roof shouting at passers by. I am very inspire from your blog, i love your simple and clean post for getting information about Bristol zoo. overall your blog and content is superb. As stated in our comment policy on spam postings, " Such attempts SHALL result in one or more postings in which we MAY be rude or we MAY make fun of you". In accordance with our policy, we opt to be rude. How can you call yourself a zoo when you don't believe in evolution? It'd be like a geology museum that thought the earth began a hundred thousand years ago and yet had to come up with explanations for sandstone that denied that they were historic deserts, that the limestone that your zoo stands on isn't the relics of Cretaceous-era coral reefs. Why do you hide the fact that many of your animals are on loan from a circus. If you believe your religious claims are valid, then surely you ought to come out and be proud of the fact that the creatures -to which humans have divine rights over- are mistreated. Why feel guilt? How can the local councils justify sending their schoolkids to a zoo whose belief system is at odds with modern rational thinking about the nature of the universe and life -and how to treat animals? If you do wish to deny the whole notion of modern rational thought then why are you using computers whose existence is based on experimental science working at the nanometre scale? At least people like the Amish and the Mennonites are willing to live consistently within their world view. We don't know what you were thinking paying some tier-3 loser to post such badly written comments on our site about your zoo, but this is the response. If you feel that our claims that your beliefs about evolution are utterly mistaken, please file a lawsuit. If you do want to pick on a bit of science, go for the low level physics stuff, the bits nobody really understands. Not evolution. Seriously. Thank you for your participation in the Bristol Traffic project. It was not expected, and no doubt, neither was this response. Oh dear, it seems Bristol City Council is making money out of us motorists again, and the Association of British Drivers are really cross. The Evening Post has it covered, in some in-depth investigative journalism. Even though we never get ticketed for parking on pavements the council have still managed to extract £4 million from us over the last year just for parking badly on the roads. "But the trouble is if you treat people like children they act like them." We're not sure if the driver of FM57WUR is actually a child, but if the ABD want proof, here it is. UPDATE: What we need is more footballers in Bristol. Just as in Bristol, there isn't enough space for all the important customers, even with echelon parking. Here is where the Palo Alto council have realised the problem, and corrected by adding free two hour parking in open parking lots. Even there, someone has tried to sneak a bicycle in. The side streets also offer unrestricted parking, making it easy to get from your SUV to your restaurant. As with the main road, "University", there is no space in a city with such narrow roads to add any bicycle lanes. Yet what do we see? Somone has snuck in a bicycle and chained it -probably illegally- to a bus stop. They should be reported to the police! 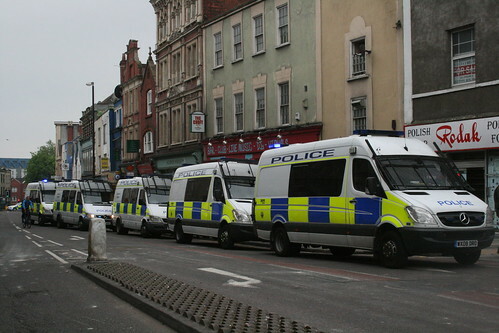 Given the news about riots in Cheltenham Road, we are pleased to inform all all readers that despite what happens over the weekend Ritas and Slix will both continue serving Bristol's best takeaway chips to passing motorists, be they minicab drivers or police riot vehicles. The latter will qualify for bulk discount. We also welcome rioters, as the two establishments do consider themselves part of the Stokes Croft community, and not some national invader that do not recognise that garlic mayonnaise is a key part of Bristol's cuisine. However, the two establishments have requested that all police car customers park in the bike lanes slightly closer to Cheltenham Road, rather than the bike lanes directly in front of the shops, as bricks and the like being thrown at vans does tend to turn away traffic. They can assure the police that parking restrictions will not be enforced (based on historical data), and that anyone cycling up to the (closed) Cheltenham Road is a troublemaker who deserved to be arrested -although only after spending their free cash at Rita's and Slix. Slix's lawyers will also be in touch with everyone who reviewed their cafe, as they are all libellous apart from the one that praises it so much it is clearly fake. The Hare on the Hill pub in Kingsdown would also like to point out that you can get a good view from there, along with a wide selection of Bath Ales beers, and as it is out of the "no drinking" exclusion zone, customers are welcome to sit outside and enjoy the "sporting fixtures" of the Easter Weekend -one in which the Royal Wedding Festivities appear to have started a week early. Trivia: next week will be the 48th anniversary of the Bristol Bus Strike. Since that date nobody except poor people without cars have taken the bus, and FirstBus have done their best to discourage even these people from using the bus, by overcharging for a mediocre service. Stanford University is on one side of El Camino Real, the town Palo Alto on the other. There is a road over El Camino, providing a safe way to walk or cycle over. But does it make people using such substandard transport options welcome? There's an under-illuminated path for cyclists and pedestrians to share, creating fantastic conflict. If the US had the Daily Mail, this would be the kind of place they'd be using in their complaints. Ignoring the four lanes of road alongside it. This is wonderfully reminiscent of the Evening Post underpass, which exists to remind people cycling and walking into the city that they are not welcome. It's like being home again. Recent studies say that Stanford University is the most bicycle friendly university in the US. We popped over to see if this was a serious risk to the US lifestyle, and hence the economic wellbeing of the entire US. First, the bad news: there are adverts praising carpooling (organised car ride sharing), trains and cycling, with some happy people on the posters. The good news: large 4x4s and SUVs block the posters from the gaze of other motorists. Nothing to worry about at this, the junction of Stanford University (on the right) and El Camino Real, "the royal road"
This is why the house has an entry on wikipedia, but the odd houses in St Werburgh's don't: nobody sees them. In case people are wondering why the posting rate of this site has dropped, it is that team is off over easter doing Important Things with Important People. Just to make it clear, those readers who walk or cycle around Bristol or other cities: you are not important. Like here, where the crossing lights on the four lane road are taped over to stop people getting the mistaken idea that it is safe to cross. We look forward to this idea being adopted in the UK. In the meantime, we shall have some photos covering how we, the important people, are important. We shall also consider whether cycling is becoming as much a threat in the US as the press makes out. We know that people have been complaining that the concorde way still forces people to cycle through bicycle-unfriendly roads in horfield. However, we have hard evidence that John Grimshaw is happy to use it. Here we see him on Dovercourt Road, looking perfectly happy. Such shared spaces are clearly to be encouraged, even if the Guide Dogs for the Blind charity is complaining about such things.They say: how can you tell where the pavement ends? We say: when you walk into a car it means you are about 50cm from the pavement. Next question? There is lots of coverage today in the cycling world that the AA is giving out free helmets and hi-viz tops, to reduce the risk of them being run over as they ride their Boris Bikes around. Some people are dismissive of this, implying that the AA is doing a publicity stunt that is really a form of blaming-the-victim. Not at all. The AA is equally concerned about the safety of motorists. Look here, in the junction of Cheltenham Road and Arley Hill at 18:11 on a weekday evening. This van OU10FYG is stationary in the middle of the junction, held up by the vehicles in front; the cars coming up from Bath Buildings or Arley Hill are at risk of running into the van, given that they have both had green lights while this van is busy blocking the junction. The hi-viz top the driver is wearing will reduce this risk, as it will be easier for cars crossing the junction to see the vehicle blocking the do-not-enter junction, so the driver will be safer. And presumably the AA's insurance costs will be reduced accordingly. I was concerned to see two cyclists lying on the road being treated by paramedics as I cycled to work today. The first one was near to The old swimming pool and the other was just a bit further up next to the Junction with Bryland Avenue. It's a crazy world out there and we would all be a lot better off if we al showed considerably more tolerance an patience towards other road users. I hope that all concerned make a speedy recovery. We'd also be interested in any details, and hope that anyone who was injured wasn't seriously injured, and that they recover fast. Amusing view behind a bicycle on Cotham Road South. As you can see the car, RJ53SPV, coming from Clevedon Terrace pulls out right in front of the bicycle. It's a clear day, no visibility problems, so why do that? Because the bicycle isn't important. It's not just to save five seconds, it's because its only a bicycle you are pulling out in front of, not, say, a bus. So it doesn't matter. The council can put as many "look out for bicycles" signs as it wants, they still won't matter. Same for pedestrians. If you matter, get in car. I've just returned from visiting a friend in the BRI who's just had an operation to put a 10in plate in his left shin, which was badly broken when a bus drove at him last Tuesday, outside the new Magistrates Courts. I have chosen those words carefully. He is an experienced cyclist, well used to the difficulties of cycling in and around Bristol for many years. His route to work takes him from Bond Street, across the 'bear pit' roundabout, and across towards the BRI. Last Tuesday, a bus on his nearside rear, drove very close and just touched him as he was riding round the roundabout. Shortly after, he stopped in front of the bus and 'had words' with the driver. He then continued on his way to work, thinking the incident was over, and had reached the Magistrates Court when the bus pulled alongside and deliberately turned sharp left, into him. His bike is written off. He has a broken leg, broken left wrist (which also has a plate) and a broken right thumb. The entire incident was captured on the Courts external CCTV, and there were several witnesses. The case is now in the hands of the CID, and I understand the driver will be charged with causing Grievous Bodily Harm, and using the Bus as (an instrument? weapon..I forget the term). Clearly the case is under investigation so I don't know the implications of giving any more detail. The bus wasn't operated by First Bus. Strangely enough, news of this incident doesn't seem to have reached the Evening Post. Or maybe I missed it. One theory is that as more people cycle, the more we, the important people, will expect bicycles. That's true, but it doesn't mean we welcome them. Instead it just makes us more frustrated. Take this video of MJ06OSJ, going up Cotham Hill. They've been held up by a line of bicycles, and when they do finally a chance to overtake, there's another bicycle coming in the other directi0n. What to do? As the video shows, the correct action is: continue anyway. If you've been held up by one bicyclist, you may as well punish another with a near death experience. It may discourage them from trying the same trick next time. Lovely video of W987MNT with a schoolkids poster in the back drifting through the red light on Stokes Croft a good three seconds after the light goes red. If you notice, all the locals expect it and nobody begins to cross the lights until all the vehicles have actually stopped moving. Lovely. Look, they even leave space on the bottom of ninetree hill for someone to push their bicycle up. FirstBus joins our campaign against Zebra Crossings! The zebra crossing wars on whiteladies road are hotting up. The bus companies had put together a proposal to make it harder to walk over the road -replacing some zebra crossings with pelican crossings, and here, by Oakfield Road, moving the crossing away from "the line of desire" and zig-zagging it so as to stop anyone with bicycle from using them. By discouraging walking and cycling, those people who don't have cars now have no reason not to use FirstBus, so will be a revenue stream. Sadly, the troublemakers -and we know who they are- pushed back, and this crossing will remain as is. What can we do? Well, FirstBus knows what to do, it's pretend the crossing isn't there. The more people realise that buses will go straight through it, the less tempted they will be to use the routes. Congratulations, then to WX06OMO, for showing strength of will and not even bothering to slow down for the person standing by their bicycle waiting to cross this junction. The Evening Post has missed it; the AA failed to issue any press releases. Yet now that spring is here, a new threat to the city has arrived: skipping. This man is skipping along the road, no hi-viz, no helmet, and looking happy. We don't pay our taxes to be stuck behind someone on a skipping rope. Did he have to take a test for this? Is the rope licensed? The sooner every pedestrian is required to wear a hi-viz top with a registration number the better, as then we will be able to report these people for unlicensed use of skipping rope on a public highway. At first it appears to be just your average viral dub made for teh LuLz and teh internetz. But watch further, this deep work of art is actually a very important public safety announcement. Special prize for anyone who can spot the character who is not using their real voice.